I have started to create bundles of my products to make it easier for buyers to get sets of my packs that go together. I began with my Kindergarten Review: Sight Words and now I have put together a review bundle for Number Sense. You not only get the convenience of getting 5 new math centers, it comes at a discounted price! I Can Make Five and Ten: A pack that works on making 5 and 10 in different ways. Works great with 2-colored counters. It includes a work mat and a worksheet for the numbers 5 and 10. Great practice for composing and decomposing numbers. Kindergarten Number Sense Work Mats: 10 different games are included in this pack: 4 roll and cover, 4 spin and cover, spin and graph, and spin and write work mats. Perfect for number sense and graphing review. Missing Numbers Task Cards: This set will provide lots of practice for stable number order. It involves 3 different activities where students need to fill in the missing numbers. Spin a Number and Spin and Make 10 Work Mats: These work mats can be used to represent numbers in different ways: ten frame, tally marks, and dot pattern, and to compose the number 10 by having students spin a number and find out how many more they need to make 10. Spinner Kindergarten Math Games: This pack includes 3 different spinners (numbers, tally marks and ten frames) that can be paired with any one of the 11 work mats that are included. Have students work alone or in pairs to make these games even more fun! 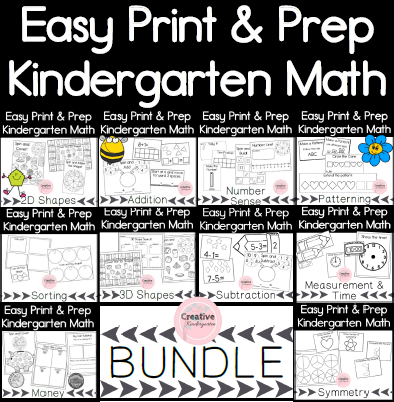 This bundle includes so many great number sense activities that can be used all year long with your students and can be used for end-of-the-year review! Rotate through these centers so students never get bored and they can work on different skills in multiple ways! All of these centers can be made reusable by putting the work mats in page protectors or by laminating them.